The highlight of my week was managing to swipe an entire case of Chukar Cherries using my trusty five-finger discount. 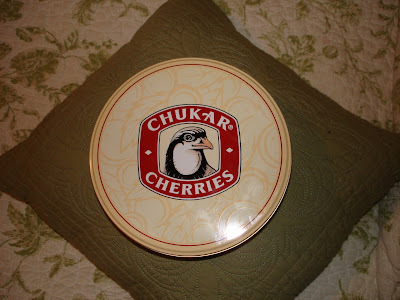 Have any of you out there experienced Chukar Cherries? They are, in a word, the bomb. (How cool do I sound saying that?) They are an overpriced little treasure of our underappreciated little region, and I don’t buy them too often. You can imagine my delight, then, upon seeing the bountiful open tins set as a centerpiece on each table at Derrick’s Psuedo-Fancy Business Thingy. My dinner companions and I munched happily on the tasty morsels before, during and after our meal, commenting on their tasty morselness and how it was a shame they were so pricey. I mentioned how, although we’d given them as gifts, we always failed to buy any for ourselves. The lovely lady on my left (who is now my new best friend), said “Don’t worry, I won’t tell anybody if you stuff some in your purse on the way out.” HA HA! I laughed, a little too loudly. Later, when I came huffing and puffing back into the ballroom after the Cricket Episode (please see previous post), everyone was leaving and I decided to grab one more Chukar for the road. My New Best Friend picked up the tin (which was still pretty full, to my surprise) and forced them on me–forced them, I tell you!–saying, “Here, just take them. What are they going to do with all these? You know they’ll just throw them out.” I hemmed and hawed for almost three seconds, then swiped them and ran. Derrick and I gorged the entire way home–cricket in one hand, Chukars in the other–and I’m happy to report that no caloric label could be found anywhere on the tin. I assauged my guilt by making him take the rest of them to work the next morning. I’m sure his fifteen employees enjoyed the four cherries we had left over. Previous Article Want Fries With That? Jen, you’ve totally been holding out! I tracked you down and ABSOLUTELY LOVE your blog! I could have posted an “amen sister” to every post! It’s official, you have a new stalker 🙂 and with that said, I was totally at chukar cherries saturday! I devoured the samples and ended up leaving with a small bag of hazlenut somethings, which would be gone except I also made cookies??? seriously what was i thinking!? Great job on the half marathon! It would seem that your standards for the position of “new best friend” have gone the way of your tastes in convenience store candy. Did you or did you not mention that EACH table at Derrick’s work soiree was adorned with a box of said cherries? For the record, had I been there you, would have left with no less than a trunkful of half eaten Chukar tins.